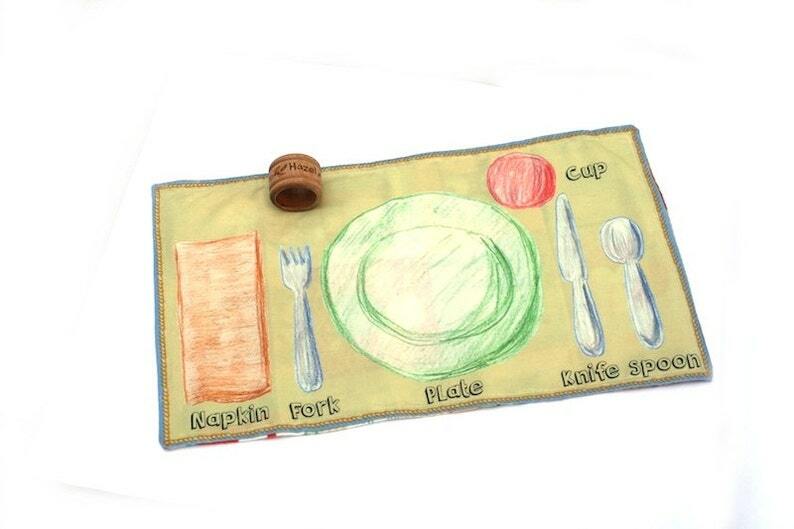 Mealtime just got more fun with our all fabric Montessori placemat! Your little one will naturally learn where to put all of his dishes and place settings by matching the dishes to the placemat. Even your toddlers can help set the table now with ease! Highly durable, the placemat measures 16 3/4" X 10" and the place settings match a salad fork or kid fork and a salad plate or child sized plate. Your placemat is bonded to a felted backing and stitched around the edges. Fraying up to the stitching (roughly 1/8") may occur and is intended to be apart of the styling. If desired, cool iron on top of placemat only. Please do not iron the backside. Cute placemat, thank you so much!